It wasn’t the usual packed house that Pat Parelli is accustomed to. The small crowd attending the 3rd International Dressage Forum in Portugal, November 6-7, 2010, numbered just over one hundred but they were a tough bunch to please. Pat Parelli was on the schedule as a speaker during the conference held at the famous Daniel Pinto Academie De Dressage Portugal. Fellow speakers and audience members included several luminaries of the dressage world; Olympians, European champions, the directors of both the Spanish Riding School in Vienna and the Portuguese Riding School, as well as riders who had just returned from competition in the World Equestrian Games. 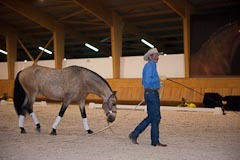 It was also a highly diverse group from several countries, which proved to be a disadvantage for Parelli. Although the conference was conducted in English, the majority of the attendees were not native English speakers. This meant that much of Parelli’s lecture presentation; which included heaping helpings of rapid-fire American slang and colorful colloquialisms, was mostly met with puzzlement by the baffled crowd. “I see a big question mark on everyone’s face”, a friend from Switzerland remarked. This is a common pitfall for Americans in general as we forget that our everyday English is very different from what Europeans have studied in formal classrooms. Speaking more slowly, speaking very clearly and avoiding slang is the best way to be understood. Unfortunately, many Americans don’t understand how significantly cultural norms differ from country to country in Europe. Portugal, for example, suffered through a revolution in 1974 and those memories are still fresh for the Portuguese people. Pat Parelli’s lecture presentation included several audience prompts such as, “raise your hand if you do this!”, which seems perfectly harmless to Americans but is regarded as an overly personal and uncomfortable thing to do in Portugal. Over all, however, Pat Parelli’s lecture presentation went fairly well. He made every attempt to be his usual positive and entertaining self, recounting stories of success that he, his wife Linda and their thousands of students have had using the Parelli method of natural horsemanship. His lecture contained many photos and videos that were well received, even though most in the audience didn’t know who Pat Parelli was prior to the conference. This, despite a full page printout in the program literature. With Pat’s recent weight-loss of thirty pounds (12 kilos), however, even his students may not have recognized him at first; he’s really slimmed down, as had his wife Linda who looked terrific. Aside from language and cultural complexities, Pat Parelli’s practical presentation was straight forward and simple in concept. He’d originally intended to demonstrate how horses who shy away from electric clippers could easily be put into a relaxed and willing state of mind using Pat’s philosophy of natural horsemanship. Parelli’s thinking on the subject was innovative. No doubt he would have successfully demonstrated a creative solution to a common problem had things turned out as planned. 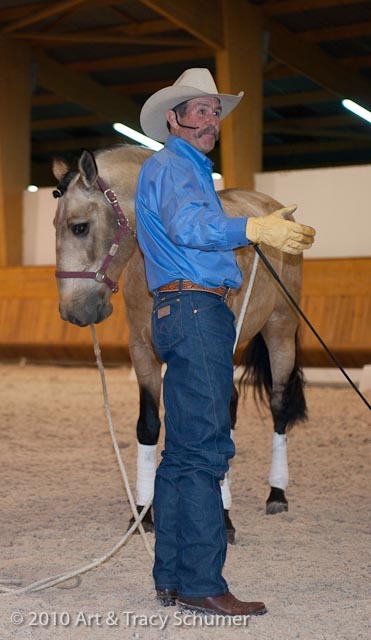 In Parelli’s original presentation, he’d intended to use an inexpensive massager, like the ones sold at household and electronics stores, to teach a horse that vibration and sound can lead to a pleasant and enjoyable experience instead of a scary one. The concept was solid but when the horse Pat was to demonstrate on was brought out, Parelli soon realized he would need to change his program. Portugal proved to be a risky proposition for Parelli that paid off but success definitely didn’t come easy. About midway through his lecture presentation, it was clear that Pat was becoming frustrated. He’s used to playing to big crowds and is famous for keeping his audience engaged but this group was different, mainly because they didn’t know what to expect. It was clear that if Parelli wanted to impress his audience, it was going to be during his practical demonstration but in the beginning at least, the horse had other ideas. The magnificent Lusitano Stallion that was brought out for Parelli to work with was full of energy and not in the mood for a massage! This horse was also stunningly beautiful, with a dappled buckskin coat and flowing black mane and tail. He had a lot of spirit and was very fit. I have to give Pat Parelli credit here as he was willing to put himself out there. Pat did not hold back or back down and he didn’t play it safe. He spontaneously decided to abandon his program and instead work with this Lusitano stallion one on one, in a large open arena and without any of his usual gear to rely on. No rope halter, no “carrot stick”, no round pen, just Pat, the horse in a flat nylon halter, a lot of open ground and a skeptical audience. Parelli improvised using a borrowed black lunge whip and a long heavy rope lunge-line. At first sight of the whip, which Parelli merely held pointed at the ground, the powerful stallion launched forward like a rocket. Pat grabbed hold, leaning back hard on the lunge-line and held on to the big guy. Parelli spent the next half hour working with the stallion. His goal, at this point, being to calm the horse and soften him into a relaxed state of mind using old fashioned hard work, decades of experience and his own instinct instead of an electrical appliance. 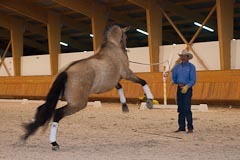 Instead of getting the horse over a fear of clippers, Pat would instead help him to not be afraid and act aggressively when he saw a lunge whip. A couple of times during Parelli’s stallion handling session, it wasn’t clear to those watching if the powerful Lusitano was too strong for one man to hold onto in open ground but Parelli prevailed and in the end, both he and the horse came out winners. It’s important to note however, there was no wall or fence to protect the audience had the horse gotten loose. We were all in Pat’s hands that night but by the close of his practical presentation, Parelli did in fact have the stallion in a relaxed state, gently rolling the lunge whip’s lash over the stallion’s neck, legs and back; the horse calmly excepting the contact, standing with his head down and licking his lips. Perhaps the most important thing Pat Parelli demonstrated in Portugal was the fact that he’s willing to put his reputation on the line to prove his methods really do work. He’s not afraid to rise to a challenge when it’s presented. This situation could have gone sour for Parelli but he’d obviously calculated those odds to be small. When I asked him about this after the presentation, he answered, “I wasn’t worried, it’s been a long time since a horse got away from me.” The audience gave Parelli a nice applause and seemed genuinely impressed with his performance; Pat Parelli has made an impression in Portugal. Comments for "Pat Parelli in Portugal"
Nicole Giger on December 01, 2010 Dear Tracy, you analyzed the show of Pat Parelli in Portugal very well. Being with you the whole week in Portugal, I am happy that I could show that good horsemanship is independent from cultural or language barriers. The meeting of Pat in the Dressage Academy of Daniel Pinto in Portugal was the best example for it and all the other experiences that you made in Portugal. I hope you come back! Miss Denise on December 02, 2010 This is excellent. I really felt like I was there. It’s good to see Pat in a “real” situation versus the “big productions” which really turn me off. I get to see Pat as an amateur cutter dealing with a learning curve like all of the other foks at a cutting. He’s just another guy, who happens to be pretty darn handy with a horse. Sometimes it’s best to forget about impressing anyone. It might be even better for the horse. Janet Hakeney on December 02, 2010 hmmmm…not so much ‘prior and proper preparation’ on the equipment front then…lol…I wanted to go but the tickets were €450…that is why the audience was so small. People complain about the cost of the Parellis stuff…but it pales into insignificance next to the elitist dressage Queens ideas of a fair price. Horselover on December 03, 2010 Mr Parelli didn’t expect a tough little portuguese crowd in Portugal. He needed to do much more to leave a good impression in the minds of people that, like him, have been dealing with horses for many years. Not the hundreds of people that are having a horse for the first time and are so easy to impressed thru a collective hysterical crowd . Mike Capron on December 06, 2010 Dear Tracy, I certainly enjoyed the article on Mr. Parelli in Portugal, I always enjoy stories about men and horses, no matter what their culture or background history was. It was a nice story about a man willing to connect with a horse in a foreign country and under strange conditions and do it with confidence for the horse.